Apparently there will be a 10ft Tux plus Linux CD handout by the Microsoft ice house Vista ad campaign in the Yonge and Dundas Square in Downtown Toronto starting in a few minutes. Wear your tshirts and hats, go be there! hello, Mr Esfahbod, I have a question about TeX e Parsi, can you make PDF output of TeX e Parsi type1? Can you add FarsiWeb fonts to TeX e Parsi, please do if you can,please!please!please! Oops I did not see your post until now (Monday). 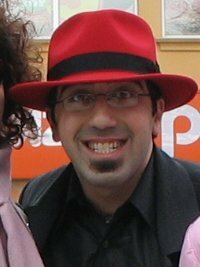 How was the Linux CD handout? Donno. I was in Boston. I hear they repeated it on Saturday too. Hello Mr.Esfahbod, at least give a hint to add farsiweb fonts to TeX e Parsi and make it type1. please don't disappoint me!